More details and complete nutritional information can be found at LoveLowFat.com/eech-eetch-itch-metch-delish-quick-bulgur-recipe/. Bulgur wheat is a versatile and healthy way to get in your whole grains. Bulgur is a type of dried, cracked wheat, often used in European and Middle Eastern dishes, such as tabbouleh. The thing I like most about bulgur is its chewy, nutty texture. 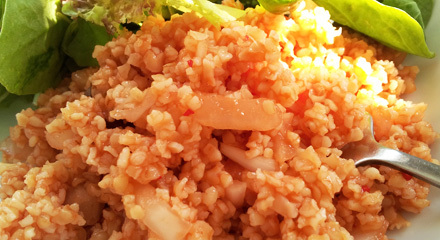 My favorite bulgur recipe is a simple but delicious Armenian dish called metch. It’s also known as eetch, itch or etch. It’s got very few ingredients, and because bulgur is par boiled before it’s dried and sold for retail, you don’t even have to cook it! You just let it sit in hot water for about 20 minutes or so before mixing it with your other ingredients. Be sure not to confuse bulgur wheat with regular cracked wheat. Regular cracked wheat is not precooked and would require different preparation. Also keep in mind when shopping for bulgur is that it comes in different sizes, some more coarse or more fine than others. The size is differentiated by number. For our recipe you’ll be using bulgur no 2. You can usually find it in a supermarket’s grain or bulk aisle. It’s also available online. 1. Let the bulgur soak in hot water for about 20 minutes, or until it absorbs the water and plumps up. You can use cooler water but you will have to soak the bulgur longer. 2. After the bulgur is prepped, drain excess water, add the rest of the ingredients, and mix well. 3. That’s about it! It’s pretty much ready! If you’re like me, you won’t want to wait and you’ll eat it right away. And you certainly can do that! But I’ve noticed the more I let the ingredients meld with each other the better it tastes. This bulgur recipe is flexible since you can modify the ingredients and their measurements to suit your taste. For instance, I’m inclined to add more lemon and more hot pepper sauce for extra zing, but some people might prefer their metch on the milder side. And, as mentioned in the ingredients list, for an option you can add some chopped bell pepper, preferably red or yellow. Chopped parsley goes nicely as well. Some people even like to add chopped scallion. For myself I prefer it the simple way as described above. Recipe makes roughly 4 servings.